Recently, Whole Foods asked if I’d like to help them celebrate cherry season by baking something delicious with their organic cherries. Cherries? And Whole Foods? Of course, I said yes! I have to tell you that I had a difficult time narrowing down what I wanted to bake with those gorgeous cherries. I thought of some far more elaborate desserts, but ultimately I reasoned that the best way to use such lovely cherries was to make something that would really let you enjoy their flavor. That led to this wonderfully delicious crumble! This crumble is so simple to make and a true pleasure to eat. 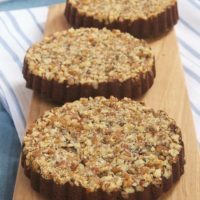 The topping is wonderfully crunchy and crispy with plenty of oats, almonds, and brown sugar. Underneath that is a simple combination of cherries, sugar, and a hint of cinnamon and vanilla. I must tell you that this has become an instant summer favorite for me and Quinn. 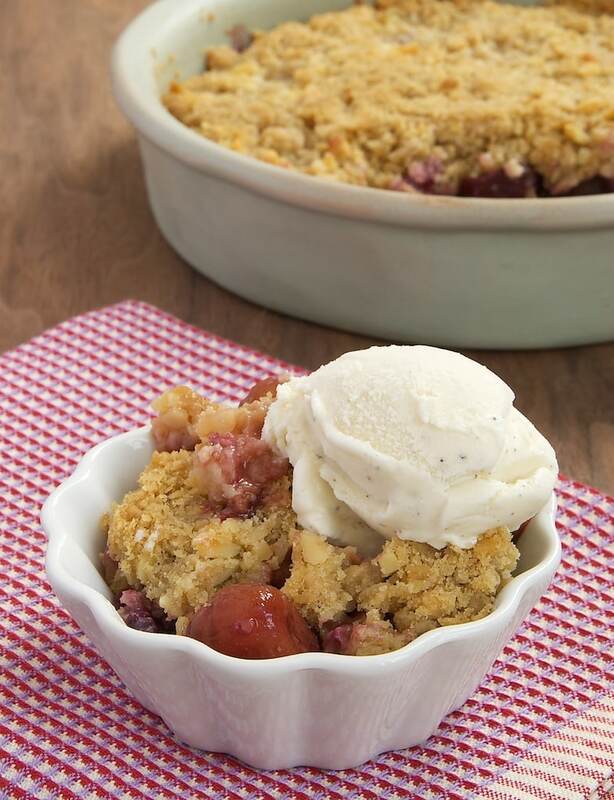 A bowl of this crumble with a scoop of vanilla bean ice cream is pretty much perfect! Find more cherry recipes in the Recipe Index! 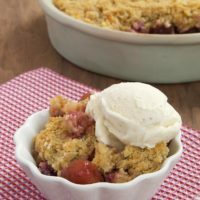 Cherry-Almond Crumble is a simple and delicious combination of fresh cherries and a sweet, nutty crumb topping. Preheat oven to 375°F. Lightly butter a 9-inch round baking pan. Combine the cherries, sugar, cornstarch, cinnamon, and vanilla. Set aside while you make the crumble. Combine the flour, brown sugar, oats, almonds, and salt. 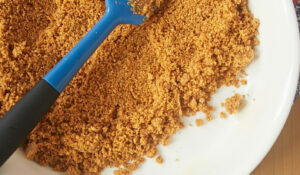 Add the butter and mix with a pastry blender, a fork, or your fingers until the mixture forms crumbs. Transfer the cherry mixture to the prepared pan. Sprinkle the crumb evenly over the cherry mixture. 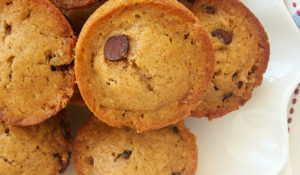 Bake 30 to 35 minutes, or until the filling is bubbly and the topping is golden brown. Serve warm, at room temperature, or chilled. Top with ice cream! *I used a combination of different cherries. Just use your favorite or combine varieties! I also used them whole, but feel free to chop them if you prefer. Whole Foods is giving one Bake or Break reader $50 in Whole Foods gift cards! You could buy your own fresh cherries or stock up on baking ingredients or pick up some great dinner options. I tend to want to get one of everything when I shop there, and I’m betting I’m not alone! See the widget below for entry details and requirements. Please note that the winner must be a U.S. resident 18 years or older. If you are unable to see the widget, make sure your browser is updated or try viewing this page in another browser. Be sure to add bakeorbreak at gmail dot com to your contacts so that a winning email from me doesn’t end up in your spam folder. If a winner doesn’t respond to my email within 48 hours, another winner will be chosen. Whole Foods provided me with gift cards for my own use and for this giveaway. All opinions written are my own. 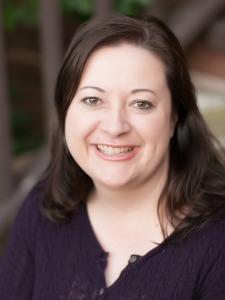 Thanks for the lovely giveaway, Jennifer! Love Whole Foods! And, cherries are my favorite fruit, too! 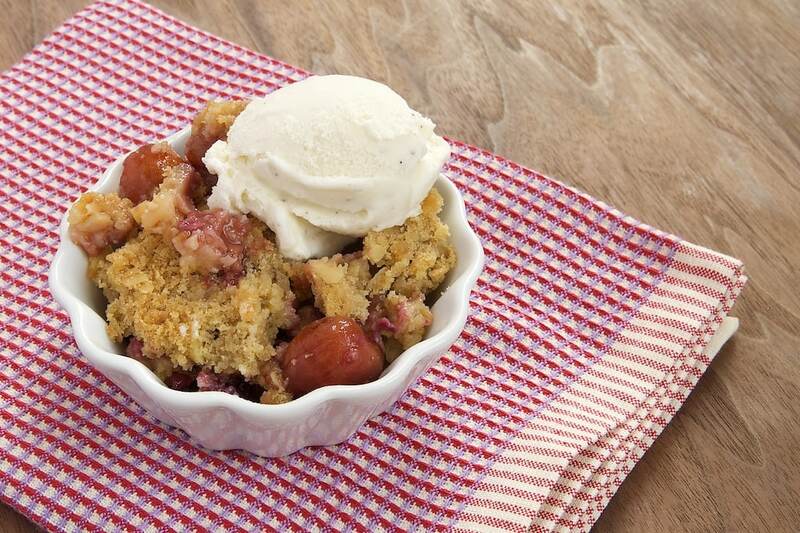 That crumble looks delicious! Thanks! 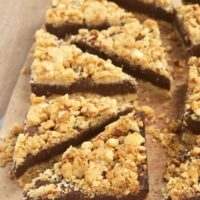 This crumble looks delicious, and I love the addition of the almonds! 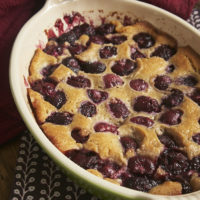 I love cherries in crisps, cobblers, or pie! I love fruit crumbles! This looks delicious! I love Cherries with Ricotta and Toasted Almonds! I made this crumble the other day with sour cherries. It is delicious! Quick to make too! I was so tempted to make it with sour cherries. Next time! Love cherries flambed with kirsch over vanilla ice cream! I like my cherries simple and delicious…so I know I’d love these! Cherries have been AWESOME this season. Can’t wait to make this with a big scoop of vanilla ice cream! 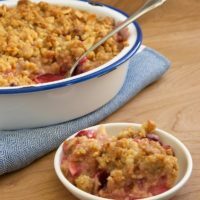 I have made this crumble a couple of times using sour cherries, with delicious results. I would like to make this for a party this weekend and will need a bit more than the original recipe makes. Was thinking maybe a 9X13 pan. 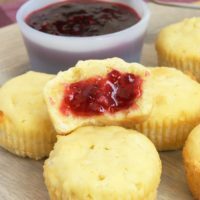 Would you have a suggestion for what fraction to increase the recipe by? I would double it for a 9×13 pan. 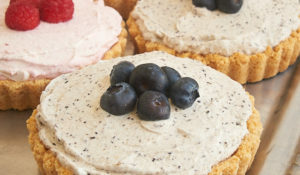 Can this be made with frozen mixed berries,? and if so, how much cornstarch should I use? and should berries be thawed first? Hi, Buni. I’ve never made it with frozen berries, but I’m sure that would be fine. You can thaw them or not. That’s up to you. I might add another teaspoon or two of cornstarch if you’re using them frozen. 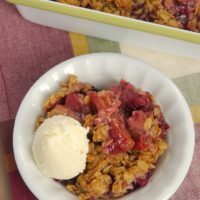 I have always loved making and serving any kind of fruit cobbler, they are usually fast and easy and come out so good! I’m trying this one of yours for the Holiday weekend! Baking is FUN!